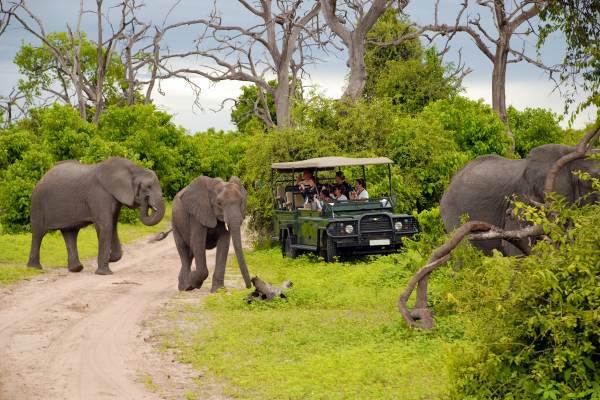 Experience a unique South African safari including incredible scenery, exciting game drives and cultural encounters. Visit two premier game reserves and enjoy close encounters with Africa’s famous wildlife and photographic opportunities. 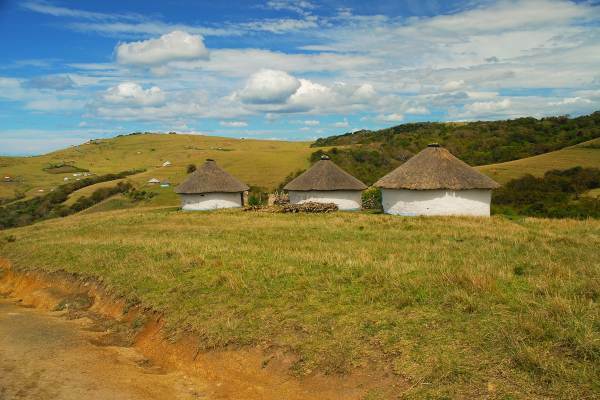 Cultural encounters in both Swaziland and Zululand, a wildlife boat cruise and hiking in the Drakensberg are some of the highlights of this accommodated safari tour. There is both an accommodated and an accommodated/ camping combo option available for this tour. Note that this tour begins and ends in Johannesburg. We schedule a group departure every Monday, however this tour works well as a private tour for couples and or family groups. Contact us for more details on private departures for this tour. We depart Johannesburg/ Pretoria Early, pick up is available from any guesthouse of Hotel in the Johannesburg/ Pretoria area. We take the scenic route towards South Africa’s North-Eastern Lowveld. Along the way we stop in the historic Gold digging village of Pilgrims Rest, followed by lunch in the little Village of Graskop (own cost). The highlight of this afternoon is the spectacular views from Gods window and Bourke’s lucks Potholes, these breathtaking views form part of the Blyde River Canyon, arguably the most amazing views and landscape in South Africa and perfect way to start our adventure. Our days starts early morning with coffee and rusks as we watch the sunrise over the canyon - followed by a leisure hike down the Blyde River Canyon to the waterfall, a great way to start the day while the air is still crisp and the sunrise provides us with wonderful pictures . We return to camp/ lodge for a well-deserved hearty breakfast. After breakfast we leave the canyon area and drive to the Village of Hazyview, we will overnight in one of the Kruger National Park Rest camps or if these are unavailable then in one of the many lodges in the Hazyview area. We arrive at our accommodation in time for our first sunset safari experience on an open safari jeep searching for the animals in Kruger National Park. We wake once again for early morning Tea/ Coffee and Rusks. We enter Kruger National Park to enjoy a full day of game viewing. The abundance of wildlife presents us with opportunities for excellent sightings and the Kruger is also home to the famed members of Africa’s Big-5. Truly the flagship of the South African national parks. Kruger is home to an impressive number of species: 336 trees, 49 fish, 34 amphibians, 114 reptiles, 507 birds and 147 mammals. An early morning coffee sees us set out on our final road trip through the Kruger to the gate where we exit en-route for the Kingdom of Swaziland. We have to go through border control. After which our first stop in Swaziland is a glass and candle factory and outdoor craft market where lunch is also enjoyed (own cost). This afternoon we will have out first cultural experience with a visit to the Matenga cultural village. This will give us valuable insight into the Swazi beliefs and customs. It finishes off with some traditional dancing and time to wonder around the markets. Accommodation: Milwane (Beehive huts) or similar depending on availability. If you are booked on the Camping version – you will stay in a hostel this night. Leaving this amazing sanctuary and country behind us we cross the border re-entering South Africa into KwaZulu-Natal province. Arriving in the small coastal town of St Lucia. This afternoon we board a small boat in the Isimangaliso Wetland park to view the many animals in this world heritage site such as crocodiles, hippos and plenty of birdlife that inhabit the estuary. Tonight, you have a free night to explore the village by foot and choose from a range of local restaurants. Recently renamed the iSimangaliso Wetland Park, this sub-tropical paradise covers about 240,000 hectares and is the largest estuarine system in Africa. The park includes the southernmost extension of coral reefs on the continent, and covers 220km of the East Coast from St Lucia to the Mozambique border. iSimangaliso encompasses a huge range of natural systems, ranging from dune, swamp and coastal forests to rocky and sandy shores, coral reefs and submarine canyons, and a mosaic of mangroves, savanna grassland, thickets and woodlands. It is the largest protected wetland in southern Africa, with large numbers of nesting turtles on the beaches; as well as the migration of whales, dolphins and whale-sharks off-shore; and huge numbers of waterfowl including large breeding colonies of pelicans, storks, herons and terns. The Park’s unique climate and position has resulted in exceptional biodiversity including some 521 bird species. This morning we enjoy a late breakfast before starting our coastal drive to Durban. This morning you have the option of either doing another safari in the Hluhluwe Umfolozi Game reserve or a visit to Shakaland to learn about the great Zulu king and the Zulu people. We then drive pass the many sugar cane fields on route to South Africa’s biggest shipping port blessed with a golden mile of beautiful beaches. After a quick drive through Durban beachfront we enjoy a lunch on the Durban Harbour. We then leave Durban for the town of Underberg to the world renowned Sani Pass where we will overnight at the foot of the Drakensberg Mountains. This morning after breakfast you will have the opportunity to do some of the many Optional Activities the Southern Drakensberg has to offer. We advise clients to consider doing the 4 x 4 Excursion up Sani Pass as described below. Your guide will help you book this. On the below optional activity you will be entering the Mountain Kingdom of Lesotho. Other Activities exploring the Drakensberg such as Horse riding walking some of the many Hiking trails in the Southern Drakensberg can be done should you decide not to so the Sani Pass. A slow morning allows for time for some optional horseback riding or a monring hike before we leave for the Northern Drakensberg . The drive takes us through some of the best scenery South Africa has to offer. The lodge’s indoor heated pool is very popular with guests high up in the Mountains. After breakfast we set off to the Royal Natal National Park on a guided hike viewing some Bushman cave paintings. We then take our final road trip back to Johannesburg. We will make a brief stop for lunch on the way back. Please be sure to let us know what your plans are for after the tour. Should you be flying out this evening it is imperative to communicate these details with your tour consultant ahead of time . We do not advise client flying our before 8pm.